At the time of writing very little is known of his life in Western Australia prior to the murders of William Anketell and Henry Burrup in 1885. It could be inferred from a statement made by Charles Zeddie (see below), that Charles may have proceeded to Roebourne shortly after his arrival in Western Australia. During the murder trial, some witnesses gave personal testimonies of Charles during the course of giving evidence and it is from these that we gain some small idea of the character of the man. Prior to the trial, Charles Warburton and San Qui were in the same prison cell in Roebourne and had the following conversation. San Qui obviously appreciated these few words from his cell mate, and his reply indicates something about the way he is spoken to by Warburton as opposed to his supposed close friend Frederick Bevan. Perhaps Charles was following his own advice too and taking solace in prayer. An observation was made by a reporter from The West Australian Newspaper at the end of the murder trial. In part it reads “An incident occurred which many may think a fair revelation of the white prisoners’ characters. 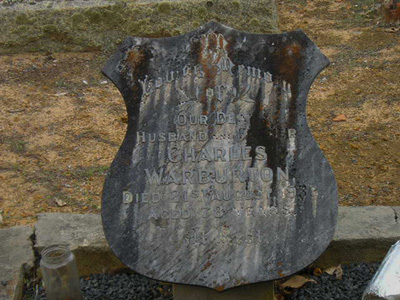 One of them warmly, and with the utmost feeling, thanked the counsel for the defence for the efforts which had saved him from the hangman’s rope.” Knowing a little of the characters of both Charles Warburton and Frederick Bevan I believe this statement refers to Warburton. in the Greenbushes Cemetery W.A.